Naan is a plain flat bread that is served in breakfast, lunch and dinner with a curry. Whereas Cheese Naan is stuffed with cheese. People love to eat this naan bread. 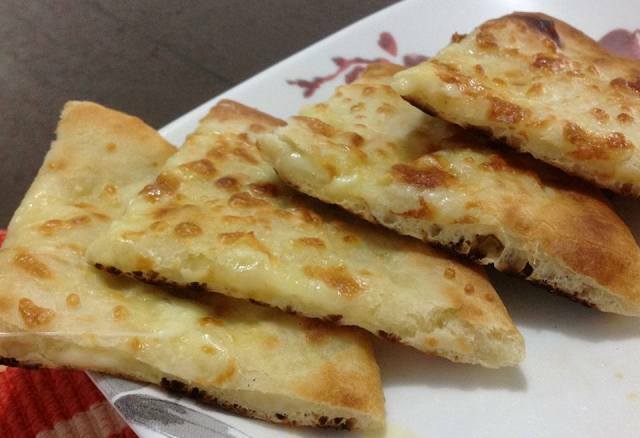 Though this is expensive as compared to other naan, but it has a tremendous cheesy taste. First time I have it at Bundu Khan Resturant. I fall in love with this cheesy naan. I know you too love the amazing taste. Take a mixing bowl; add all purpose flour, yeast, baking powder, sugar and salt. Mix all. Make a well in center and pour oil, yogurt, and half egg. Mix in well then mix with dry ingredients. Add slowly luck warm milk and water, knead the dough until soft. Cover the dough with damp cloth and leave for rising for 45 minutes at warm place. After that punch the dough and divide into 6 equal balls. Roll out two balls in disk size. On one disk spread grated cheese and cover it with other rolled disk. Seal the edges. Apply egg on top, sprinkle nigella seeds. Repeat with other balls. Bake in oven for 3-4 minutes. On the grill for 1 minute to give a brown color on top. Place a slice of cheese in center, cut into slices and serve hot.